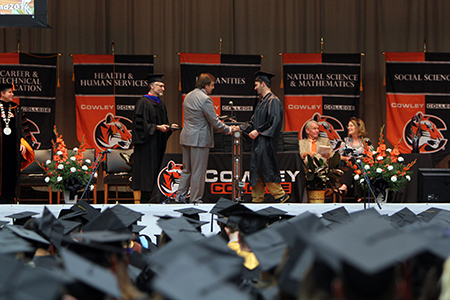 A total of 327 students participated in Cowley College’s 93rd Commencement exercises Saturday inside W.S. Scott Auditorium. Along with the conferring of degrees, Linda Fund, Executive Director of the Kansas Association of Community College Trustees, served as the featured speaker at Commencement. Student Senate president D’Abreian Bush, and Student Senate vice president Madeline Pegorsch, also addressed the class as did Outstanding Tiger Alumni award recipients Otis and Terri Morrow. The students included summer 2015 graduates through summer 2016 graduates. Students who graduated last summer and last December have received their diplomas. Saturday’s graduates will receive their diplomas in June. A total of 611 students were candidates for graduation. A reception for graduates, family members and friends was held immediately following the ceremonies in the Earle N. Wright Community Room inside the Brown Center.